I don’t usually read books simply because of who writes them…even if I have previously enjoyed a work by a certain author, I need to have some interest in the actual story before I’ll read something else by them. However, if you know me, you’ll know that one of the few exceptions I have to this rule is Meg Rosoff. I will read anything by her, even if I have absolutely no interest in the story! So when I heard she had a new book coming out, I pre-ordered it right away. 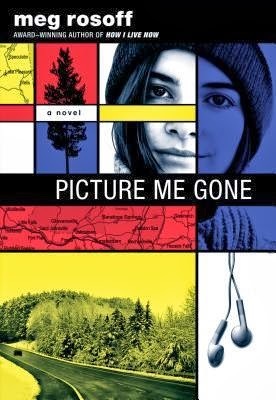 Picture Me Gone is about a girl, Mila, and her father traveling to the States in search of her father’s old friend, Matthew, who has disappeared from home without taking anything with him. This was a really good story. Normally I am not a big fan of mysteries, but I thought this one was done really well. It’s not a who-dun-it kind of mystery. While trying to figure out where Matthew went and why he left his wife, baby, and dog behind, Mila discovers more and more about the complexities of his life, and she slowly pieces to together the sad reasons behind why he left home. Mila was a good character. She has, like, Sherlock-esque abilities to observe and deduce things, but she’s definitely easier to get along with. She’s quiet, and sort of confident and laid-back, but in an honest, serious way, without any of these traits being things she works on; they are just naturally part of who she is, and I think she’s a great character because of that. The story is not a super happy one. The ghosts of Matthew’s past are troubling, and I think the real purpose of the story was Mila having that painful realization that grown-ups, and parents especially, are real, imperfect people. She struggles to understand Matthew’s reason for leaving home, and she also has to come to terms with some new revelations about her own father. But it’s not a totally depressing tale, either. There is some possible-in-the-future light romance, and Mila has some good moments in her trip to New York. She also has a good relationship with her parents, which I always appreciate in a story. Bascially, I enjoyed this read. I will say that the only thing I didn’t like was that there are no quotations around dialogue, which I found unnecessary and a bit annoying, so beware! But honestly this was a great book, and I definitely recommend it!